1. Start by standing with arms by your side. 2. Inhale while lifting your arms up, then reach your left arm out to your side. 3. Reach the left palm back and to catch your left foot from the inside so that your inner elbow is facing away from your body (keep all fingers together in the grasp on the left foot). 4. Inhale and lift your heart center. Exhale and begin to press the top of your left foot into your left hand creating more and more space between your left heel and gluteus. 5. Lower your right palm towards the floor and hollow the right underarm as you draw the right shoulder blade to the back side of your heart (this ensures that both sides of the heart stay evenly lifted). 6. Reach the inner left thigh up towards the ceiling to keep the hips parallel. Draw the right shin in towards the midline and widen the inner right thigh behind you. 7. To make sure that the standing leg does not hyperextend, the top of the right shin moves forward and the top of the right thigh moves back until the leg is straight and all joints are stacked. 8. Scooping your belly from the top of your thigh, lengthen your tailbone down towards your left knee. Although the belly does come closer to the floor the heart center stays lifted, as does your gaze. Hold on one side for one minute and then alternate sides to maintain symmetry. This posture is challenging and the rhythmic breathing will help you to stay focused, relaxed and centered. Properly done, standing bow bulling will help you build concentration, determination and patience. 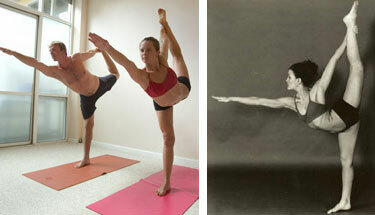 The Standing Bow Pulling pose is a signature pose of Yoga champion, Huiping Mo. Huiping Mo was crowned Women’s World Yoga Champion in February 2005 following an international competition held in the US. A former professional ballerina from the world famous Joffrey Ballet School in New York City, she began yoga training in 1997 and in 2000 received her teaching certificate from Bikram’s Yoga College of India in USA. She furthered her yoga studies with a 2-year Teacher’s Training Program at the Yoga Research Education Center USA. The post is nice.. This is also called dancing pose ? Hi Keeyit, thanks for visiting. Yes this pose is commonly known as Dancer Pose. Dancer Pose does have several variations depending on how the hands are placed to hold the leg. I sweat a lot and as such find it hard to do balancing and certain poses and i tend to slip. What’s the best way to overcome this? Also, when i do poses on one leg, usually my feet tends to cramp. What am i doing wrong? In balancing poses such as Standing Bow Pulling, your foundation needs to be strong, that means you should work on your standing leg strength first and of course your flexibility. Balacing also requires concentration so you should fix a focus point which works for you. In yoga this is called dristi or the direction of your gaze. Your cramp may be due to inadequate leg strength causing excessive muscle stress and/or excessive sweat causing your body to loose salt. Start by practising easier standing balancing poses such as the Eagle pose (Garudasana or Garuda-asana) and Tree pose (Vrksasana or Vriksha-asana) and build from there.